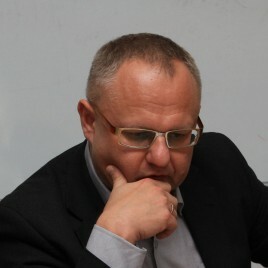 A professor of philosophy at the Institute of Philosophy and Sociology of the Polish Academy of Sciences and at the Faculty of Artes Librales of the University of Warsaw. He is interested in theories of power, the theory of literature, linguistics, cognitive studies and psychoanalysis. He is the author of many books and articles; the most important of them include Odkrycie nieświadomości [The Discovery of the Unconscious], Galaktyki, biblioteki, popioły [The Galaxies, Libraries, Ashes], Władza i rozum. Stadia rozwojowe krytycznej teorii społecznej [Power and Reason. The Reflective Stages of the Critical Social Theory], Granice polityczności [The Limits of the Political] (with Paweł Dybel). His recent books include: Deferring the Self, Grammar and Glamour of Cooperation, Ćwiczenia z przyjaźni [Exercises in Friendship], Lektury retroaktywne. Rodowody współczesnej myśli filozoficznej [Retroactive Readings. Origins of Contemporary Philosophical Thought] and Polska pozycja depresyjna: od Gombrowicza do Mrożka i z powrotem [The Polish Depressive Position: from Gombrowicz to Mrożek and Back], published in 2015. He was nominated three times for the Polityka's Passport award (1997, 2003 and 2004).